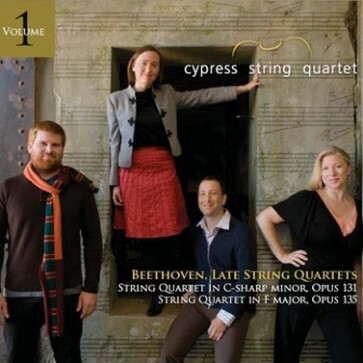 "Another recording of Beethoven String Quartets seems almost unnecessary, but this one by the San Francisco-based Cypress String Quartet doesn't belong on the slush pile. Presenting two late works, the Cypress players converse with such rare sincerity as to make long-familiar music sound utterly fresh. Throw in their technical aplomb and rich, cohesive tone, in which every voice is significant, and you've got a pair of definitive statements. Happily, more are coming; This is merely volume one. Grade: A"